St. Thomas Episcopal Church, Battle Creek, MI. 1878. The first Episcopal services in Battle Creek were held in a schoolhouse in 1839, eight years after the frontier town was founded in 1831. Organized in 1842, St. Thomas Church Parish erected its first church home in 1848 at a cost of $300. Growth of the parish over the next thirty years required the razing of the first church in 1875 and construction of the present larger church on the same site. Completed in 1878 at a cost of $20,000, the brick Gothic Revival building holds more than thirty stained glass windows made by J. Wippell & Co. of Exeter, England, the Willet Stained Glass Studios of Philadelphia, PA, and unknown makers of the original windows installed in ca. 1876 and the early 1900s. Throughout the years, many of the early windows were destroyed by roof fires caused by sparks from a neighboring foundry chimney. Between 1950 and 1970, new stained glass windows replaced those that had been lost to fire. Several of the newer windows are shown below. 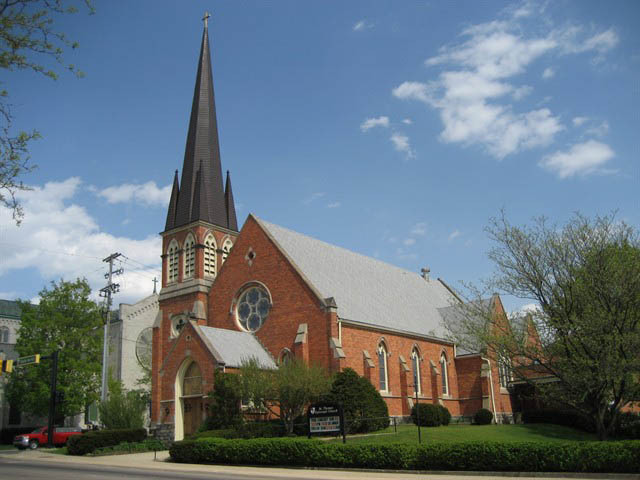 St. Thomas Episcopal Church was registered in the Michigan Registry of Historic Places in 1959. 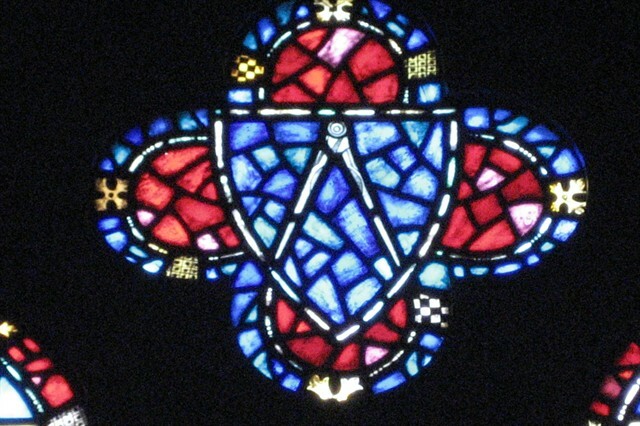 Two of his attributes, the square (left) and the compass (right), are shown in the quatrefoils overhead. The Sacrament of Holy Unction. J. Wippell & Co., Ltd., Exeter, England, ca. 1951. 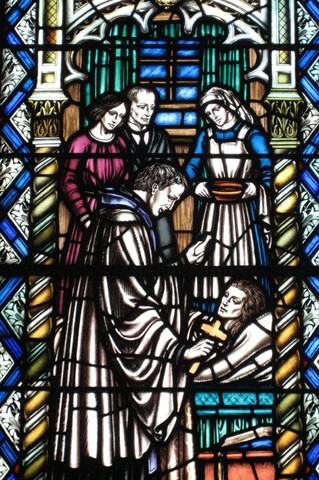 One of six windows that illustrate Holy Sacraments of the church, this window depicts a priest holding a vial of holy oil with which to anoint a dying woman. 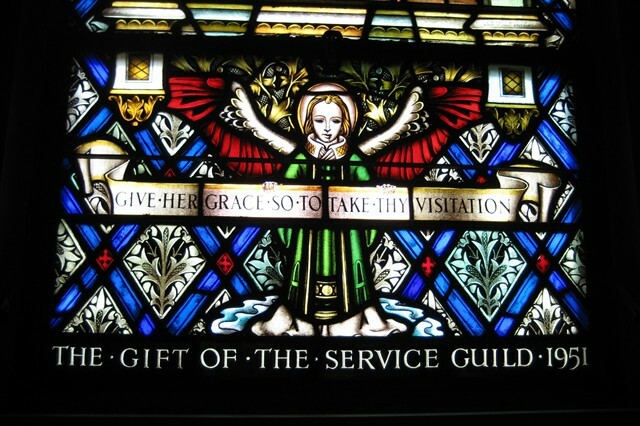 Below the window, an angel holds a banner with the inscription, "Give her grace so to take thy visitation." The Sacrament of Holy Matrimony. J. Wippell & Co., Ltd., Exeter, England, ca. 1951. 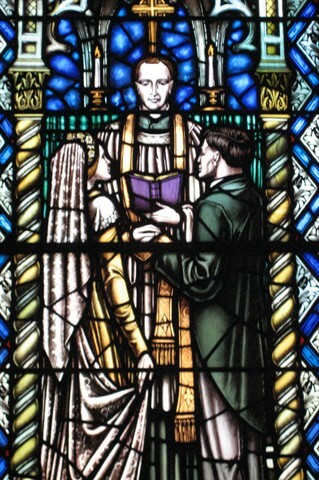 In this wedding scene, the priest has tied the hands of the couple with his stole, from which comes the expression, "tying the knot." 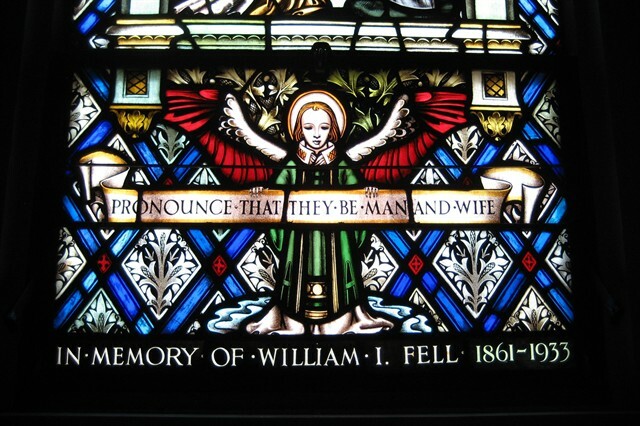 The inscription on the angel's banner reads, "Pronounce that they be man and wife." The "Te Deum" Windows: Christ as the King of Heaven. J. Wippell & Co., Ltd., Exeter, England, ca. 1954. Two companion windows above the chapel altar express the "Te Deum," a traditional hymn of praise. 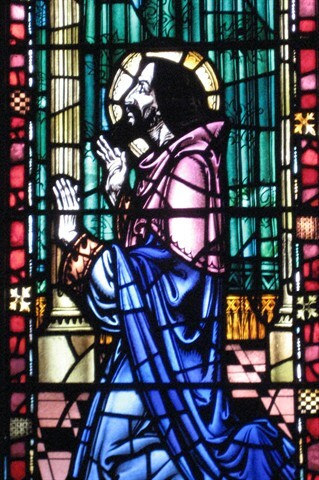 In the left window, the figure of Christ is dressed in royal robes. St. Matthew and St. Mark are symbolized by their attributes, an angel and a winged lion. The "River of God" flows through both windows. Inscribed below are the words, "We praise thee, O God." 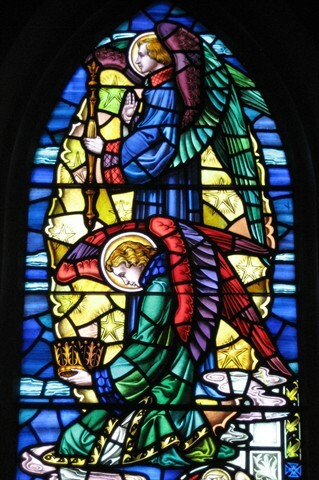 The “Te Deum” Windows: Two Angels. J. Wippell & Co., Ltd., Exeter, England, ca. 1954. The companion “Te Deum” window above the chapel altar depicts two angels with offerings of crown and scepter, symbols of royal authority. St. Luke and St. John are represented by their attributes, a winged ox and an eagle. Parable of the Good Samaritan. Willet Stained Glass Studios, Philadelphia, PA, ca. 1970. 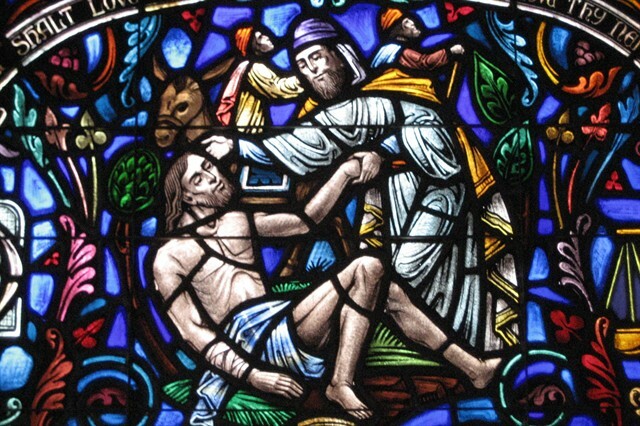 Some of the windows made by the Willet Studios for St. Thomas Episcopal Church depict the parables or short stories used by Jesus to teach spiritual truths. The Book of Luke relates the parable of the Samaritan's compassionate aid for an injured traveler who had been attacked by thieves, left for dead and ignored by those who passed by. (Luke 10: 29-35). The inscription above reads, "Thou shalt love the Lord, thou shalt love thy neighbor." 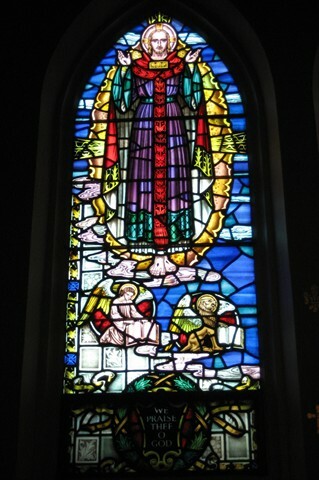 The Willet windows for St. Thomas Episcopal Church were designed by Eric Sundean, Marguerite Gaudin and Anthony Mako. Parables of the Good Shepherd, the Lost Coin and the Sower. Willet Stained Glass Studios, Philadelphia, PA, ca. 1970. Three chapel windows illustrate other parables found in the Book of Luke. The good shepherd who seeks his one strayed sheep (Luke 15: 3-7). The woman who searches for her lost coin (Luke 15: 8-10). The sower of seeds, or spiritual truths, that fall on stony ground (deaf ears) or good ground (receptive ears) (Luke 8: 1-15). "Prayer for All Conditions of Mankind." Willet Stained Glass Studios, Philadelphia, PA, ca. 1970. Four windows in the church entrance contain images that represent various faiths and nations praying together for unity and world peace. 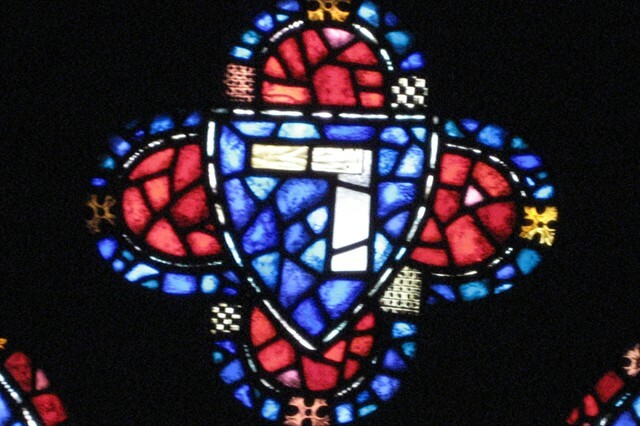 Two companion windows are inscribed "We pray for thy holy church universal in unity of spirit in the bond of peace." The entrance windows underscore the spirit of religious freedom and human rights associated with Battle Creek, the former home of abolitionist and women's rights activist Sojourner Truth, Seventh-day Adventist founders Ellen and James White, and the Underground Railroad station operated by Quaker Erastus Hussey. The same concern for social justice and community cooperation is reflected in many outreach programs of St. Thomas Episcopal Church today. 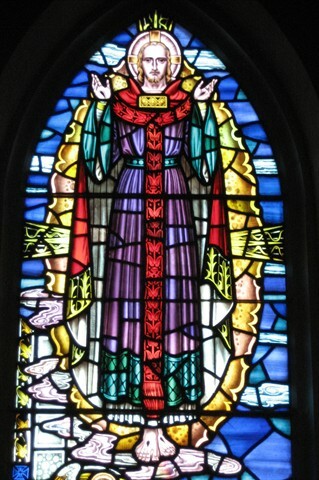 St. Thomas Episcopal Church was registered in the Michigan Stained Glass Census by Jon Eric K. Rasmussen of Battle Creek, MI. Ashlee, Laura Rose, ed. Traveling Through Time: A Guide to Michigan's Historical Markers. Rev. ed. Ann Arbor: The University of Michigan Press, 2005. The Holy Bible, King James Version. (New York: American Bible Society, 1999). Published May 2000 by Bartleby.com; ©Copyright Bartleby.com, Inc.
Jones, Robert O. Biographical Index of Historic American Stained Glass Workers. Kansas City, MO: Stained Glass Association of American, 2002. Metford, J.C.J. Dictionary of Christian Lore and Legend. London: Thames and Hudson, Ltd. 1983. Text by Betty MacDowell, Michigan Stained Glass Census, September , 2008.